You know what we're sick of? The whole notion that witches are ugly hags who dress all in black, are covered in warts and have crooked noses, bad breath, and spindly fingers. Most of the witches we know are total knockouts, with serious senses of personal style and fashion-forward looks! Don't believe us? Pick up a copy of Rogue magazine—the world's leading high fashion mag for the dark arts—and see for yourself. There are some highly editorial looks in there! That's why we love to see accessories such as this Witch Hat with Purple Veil. It's stylish and powerful, or as the tagline of Rogue reads, it's "pointed, with a point of view." This show-stopper is a classic, conical silhouette with a modern twist. Vibrant violet mesh covers the black base, creating a subtle sheen when it catches the light. A beautiful brooch adorns the side, while a delicate veil hangs around the brim. 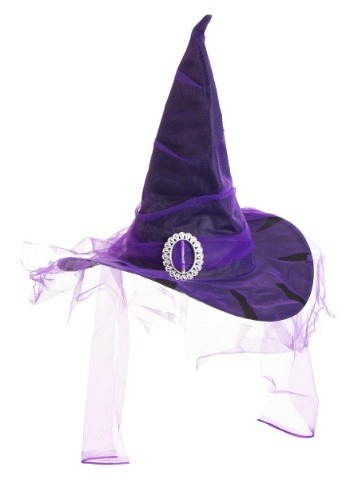 There's no toil or trouble when it comes to this hat, unless that's the spell you choose to cast in it! This wearable and winsome hat will pair with any of Rogue's fall editorial picks. So wear it proudly and remember, you can be gorgeous and powerful; in fact, you already are!